Hello Joyce, so where ya from & where ya at, Geographically speaking? I’m originally from Hong Kong but I have been living in Leeds for 8 years. People tell me I now speak with a Hong Kong/Yorkshire accent. I am pretty proud of that. When did you first realise you could write for the stage? When I realised that writing for the stage is not about pen and paper (or screen and keyboard). I write with choreography, rhythm and pacing, light and sound including words and voices. I try to treat the script to my theatre like notation to music. Which playwrights have inspired your own writing? Antonin Artaud, Jerome Bel, Isabel Allende, Susan Sontag, Roland Barthes. They are not playwrights but they inspired me. They gave me imageries, intensions and provocations. What is the difference between Chinese Theatre & that of the West? Haha can someone please first sum up what ‘Theatre of the West’ is? As you can imagine it is both impossible and wrong to try and summarise. From my observation, There are a lot of theatre venues where I came from in Hong Kong that look like the venues I see in Europe. Performance happened within them and tended to be similar to each other, no matter where they come from. It is when you venture outside the boundaries of theatre venues then you will discover the joy of diversity. Go to a tiny factory or flat, converted into a studio theatre and see what independent theatre makers are passionate about and how they make theatre with minimum resource; go to a teahouse or community centre to see Xiqu (generally known as Chinese opera), which has got a totally different aesthetic on stage and etiquette off stage; or even a pedestrian only street to see what tricks street performers are up to. Theatre is everywhere. What does Joyce Nga Yu Lee like to do when she’s not being theatrical? I like gaming on my phone or computer. I enjoy a good story without stressing about my HP all the time, so I am more into RPG, adventures and puzzle games. I particularly like classic Chinese martial arts RPGs which I play on DOS simulator. I also like reading: sci-fi, history, science, economics, politics, manga… just not romance. Can you tell us about your company, Mind the Gap? Mind the Gap has been creating work since 1988 and I’m pleased to say that we’re one of Europe’s leading learning disability theatre companies. We’re all about creating an arts sector where there is equal opportunity for performers with learning disabilities, creating work for local, national and international audiences. The type of work we produce includes touring theatre, site sensitive productions, forum theatre and more recently street theatre. We make work alongside people with learning disabilities that excites, surprises and challenges audiences. You are also the artistic director of the multi-art form Daughters of Fortune. Can you tell us more about this project.? Daughters of Fortune looks at humanity through the eyes of parents with learning disabilities. 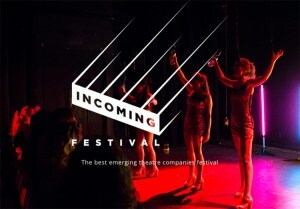 It involves three live performance outputs, the three daughters: Anna, a interactive forum theatre piece; Mia, a contemporary studio theatre piece and Zara, a large scale outdoor spectacle. Anna and Mia are perfectly formed “sisters” and now on the road. The little sister Zara, who is due early 2019, however involves the biggest ambition. Zara will feature a three storey tall puppet baby, with epic choric movement of people and vehicles. Just imagine a cross between Godzilla, District 9 and the opening ceremony of the Paralympic Games. Through Daughters of Fortune you are bringing Mia to the Fringe, can you tell us about the play? Mia is a fast moving contemporary performance that appeals to audiences who like the new and authentic. In partnership with Royal Holloway and with the support of the Wellcome Trust, the team collected real stories from parents with a learning disability. Everything in Mia is grounded in real life stories. The subject matter is impossibly complex, the performance is composed to reflect this complexity. The performance is structured with a series of non-linear episodes strung together with a progressive narrative arc. The episodes vary in form and pace, from high energy pop dance to intimate acting, low tech object manipulation to live feed camera and loop pedal. Mia is highly demanding for the performers, and catered for audiences with a critical and inquisitive mind. What emotive response do you expect from the audience? Some feedback I heard frequently was that it was like an “emotional roller coaster”, and “laugh one minute and cry the next”. Mia is full of jump cuts between light and shade, sometimes the absurdity of reality even renders us not knowing whether to laugh or cry. When you leave the theatre, I hope you feel entertained, but also feeling a bit more human and energised for action. What does the rest of 2017 hold in store for Joyce Nga Yu Lee? When you see me in Edinburgh this year you will see me sporting a baby bump 🙂 Isn’t it interesting? While I am heading a project about having babies, I am making one in my belly. This is an incredible experience. If you have read our marketing material, you’ll see the doubts and questions one may ask when considering having kids: can I cope? Will I be able to afford it? Will I screw it up? These are real questions I am asking myself. I still can’t answer yes to all these questions, but I’m trying my best and ain’t letting fear stop me. Posted on July 12, 2017, in Uncategorized. Bookmark the permalink. 1 Comment.